The blade is 1095 carbon steel blade has been heat treated using traditional Japanese techniques -- by water quenching and clay tempering. This technique results in a strong a hamon (clay heat treatment line) that travels along the blade -- showing the transition between the soft, supportive spine and the ultra-hard, keen edge. 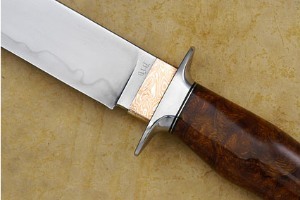 Many of Bill's knives show the influence of Japanese bladesmiths. 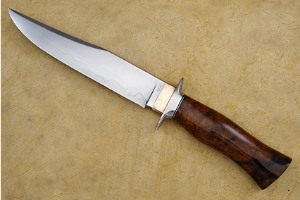 This is one such knife. The habaki (blade collar) is formed from mokume gane forged from copper and silver). 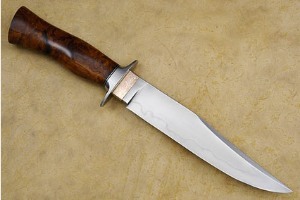 A mild steel guard is perfectly fit to the exhibition grade desert ironwood handle. The handle has been carved so as to swell at the center and at the pommel. 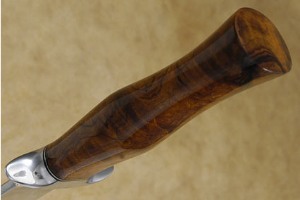 The resulting handle is among the most visually captivating and tremendously comfortable handles I have encountered. Black fiber spacers allow the handle to adjust to temperature and humidity changes. Exceptional fit and finish throughout!